It has 4 luxury bedrooms, all en-suite and with a private Infinity pool offering stunning panoramic views over Coral Bay and the coastline from Sea Caves to Paphos, as well as the mountains. You approach Villa Adonia from the West and Peyia Village centre. 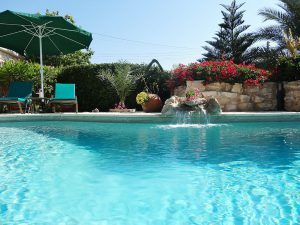 They is ample parking for two cars in the drive in front of the villa and you then enter up a short flight of steps to the raised and flat garden, patio and pool area. There is plenty of space for sun loungers, both round the pool and on the balcony, where the sun worshippers can move their lounger with the sun. However, for those who prefer shade, there are over hangs around the outside and also umbrellas provided. Adonia also has outside dining furniture, seating 8 people, in the pool area, with sea horizon views. The BBQ is located in the patio area, with its own sink and facilities. The back garden is landscaped with its own fruit treas. You can access the back garden via the kitchen back door, or by walking round either side of the villa. There is also an outside Utility Room, which includes the washing machine and storage for the sun lounger mattresses and cushions for outdoor furniture. The Kitchen – spacious, fully equipped kitchen, with a back door leading onto the back garden and fruit trees, to pick your own fresh fruit! There are also large patio doors, leading onto the spacious pool area and outside dining table, seating 8 people. The kitchen has a ceramic hob and electric oven and is fully equipped with microwave, toaster, kettle and all items required for a home from home. There is also a large a fridge freezer plus a separate water dispenser and cooler. Lounge – contains plenty of good quality seating for full occupancy. The lounge leads through to an open plan dining room. Very light and airy rooms, with windows down one side of the wall, a set upf patio doors, on the side of the dining room, leading to the BBQ and facing the front, 4 large patio doors, leading onto the large pool and patio area and outside dining and seating. The inside dining table seats 8 people and has a set of placemats etc to match the interior decor. There is also a real log fire for use in the winter months and central heating, provided at no extra costs. The TV has 100’s of channels from around the world, plus lots of films and TV shows. There is also a DVD player, separate CD and radio player and in the cupboard, some games, DVDs and CDs. Master Bedroom – Located Upstairs. Large bedroom, with huge en-suite, it is light and airy, with king size bed and ample wardrobe and drawer storage. Bedding and curtains have recently been updated to modernise the look of this traditional-style villa. There are patio doors leading onto a large balcony, again, with sea views over Coral Bay beach, overlooking the spacious and large pool area. There is outdoor furniture on the balcony, to relax and admire the views. Master En-suite – very large and spacious bathroom with whirlpool bath, shower and 2 sinks. Window with mountain views. Twin Bedroom, no.1 – Located upstairs. 2 single beds, in a large room, with en-suite shower room. 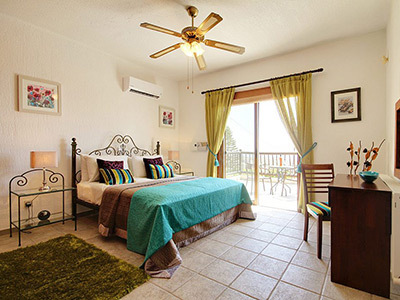 Large window in the room, providing daylight and also patio doors, leading onto the spacious balcony, with outdoor furniture to enjoy the views over Coral Bay. Double Bedroom – Located downstairs. King Size bed, with en-suite shower room, recently updated with new, luxury furnishings. The bedroom has windows with stunning sea views over coral bay beach and patio doors leading onto the spacious patios onto the pool area. Twin Bedroom no.2 – Located downstairs. 2 single beds, in a large room, with en-suite shower room. Window in the room with views onto the back garden and fruit trees. Utility Room – located outside, includes cleaning equipment and washing machine. Mattresses for sun loungers and cushions for outdoor furniture stored in here also. The private, landscaped gardens surround an Infinity Pool, with spacious areas to sunbathe all day. The villa attracts the sun all day long, so you can even have your evening BBQ in the sun. There are also plenty of shaded areas, for those who wish to shelter and there are seating areas in the shade, as well as the sun loungers around the pool with comfortable cushions and supplied beach towels. The outside furniture includes dining table and chairs, sun loungers, sofas and additional seating. There are front, side and back gardens and a selection of fruit trees from which to pick! The 2 large balconies, leading from both the master bedroom and one of the twin bedrooms, also include table and chairs, both with stunning panoramic sea views. The villa is not over-looked by other properties, so you can enjoy privacy at all times. There are private parking spaces at the villa for two cars. For more information on the villa and the area see here. 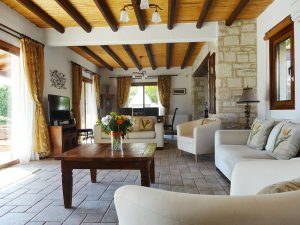 We also have a neighbouring 3 Bed villa next door, in the same style. See Villa Harmony.